CardioExpress SL12A is designed for high volume use in busy departments. Real 12-lead ECG with built-in rechargeable battery to allow for portability. 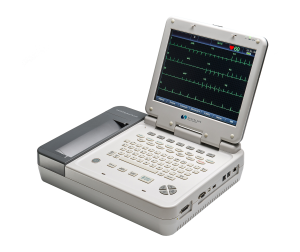 Pacemaker detection that meets the requirements of ANSI/AAMI EC11. 12.1” foldable high resolution color touchscreen to allow for ease of use and interpretation. Automatic measurement and interpretation tested with authoritative CSE database along with advanced features such as real-time waveform freeze and automatic arrhythmia detection. Complete digital filters, minimizing baseline drift, AC and EMG interference. Using the secure and scalable Sentinel cardiology information management system to facilitate analysis and reporting, the CardioExpress SL12A will fulfill your diagnostic ECG needs to support a true and accurate analysis of your patient’s ECG data.